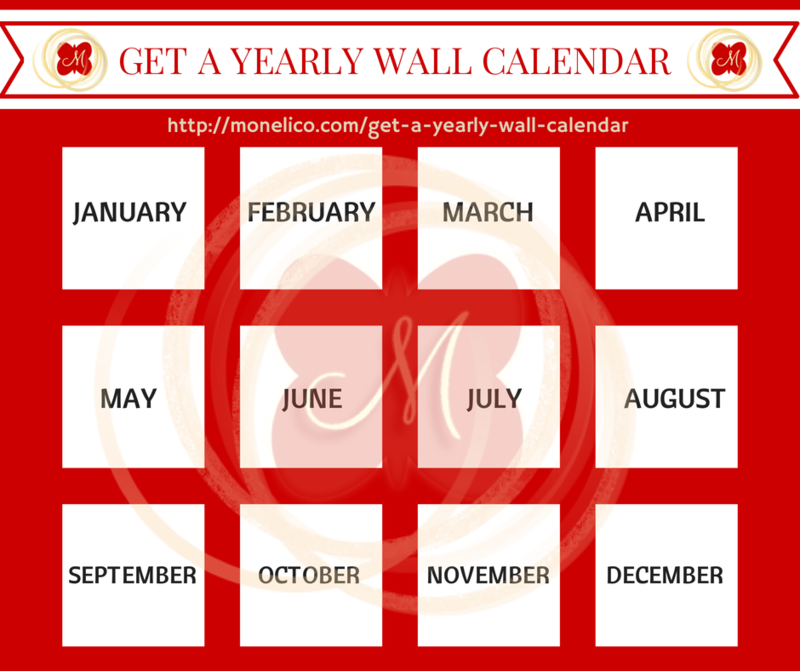 The idea of getting a LARGE yearly wall calendar first came to me from Caterina Rando when I attended one of her Sought After Speaker Summits. 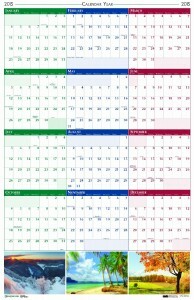 She uses it in her speaking business but I would like to go over the benefits of having this type of calendar in your home office for your Direct Sales business. 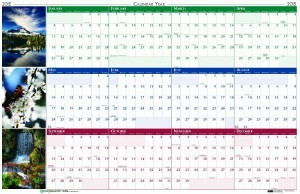 In this industry we have so many tasks and activities to plan and schedule throughout the year. Some are daily, some are weekly, others monthly, and even seasonally. There are also things we need to track and prepare for that occur yearly. 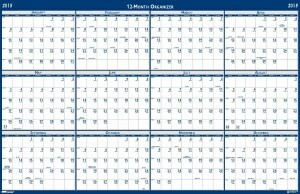 Having a large wall calendar that shows you the whole year at a glance is very beneficial for planning, prioritizing, and managing your schedule. 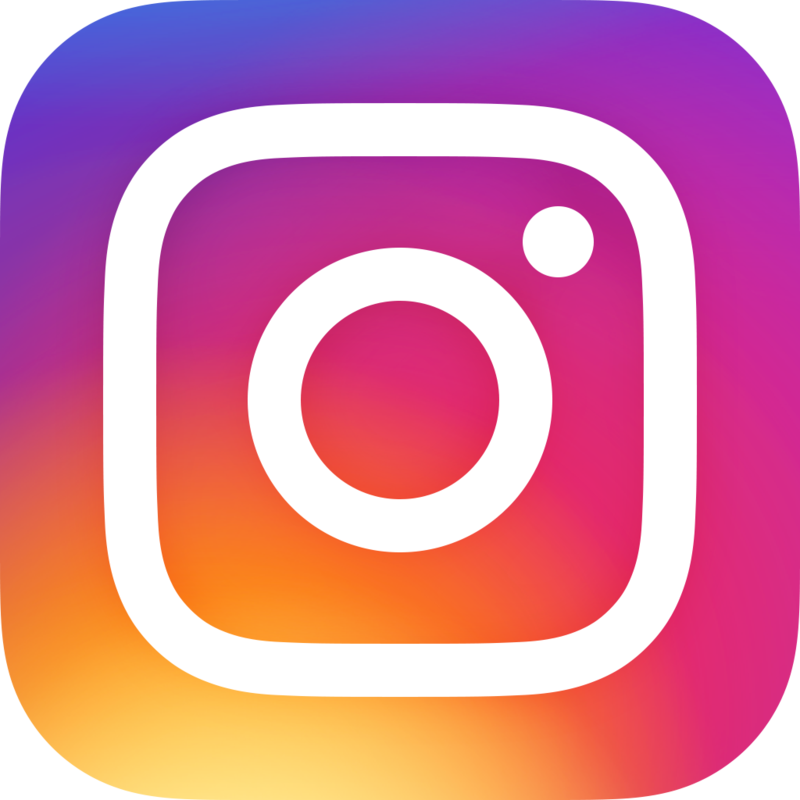 And then there are the things that happen yearly, like your national conference, a yearly vendor event you participate in, holiday and anniversary sales (Black Friday/Cyber Monday), customer appreciation parties, planned vacations, and more. 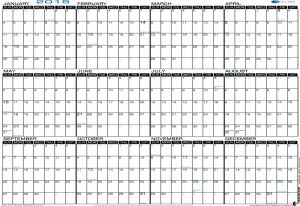 Organization software, electronic calendars, and mobile apps are fantastic for tracking your daily, weekly and monthly activities, but oftentimes it helps to be able to see the big picture of the whole year. When you set up a large wall calendar in your office it makes planning so much easier, especially if you are a visual person like I am. By knowing what you have planned or have committed to months in advance, you can be better prepared for those events and avoid derailing your daily, weekly, and monthly activities that are crucial to maintaining order and organization in your business. Organization and time management has been a life long struggle for me. I was diagnosed with Attention Deficit Disorder as an adult at the age of 26 and until then I thought I was doomed from ever having peace and order in my life. To be honest, I didn’t even know what that was until a friend of mine whose husband had ADD gave me a book to read about adults living with ADD. Back then, it was not discussed loosely like it is today in schools and self-help books, or joked about so casually like it is on TV and social media. Maybe it was, but I certainly never noticed it. I would like to point out that I do believe that many children today are wrongly diagnosed and over-medicated, but there are some of us who really do have a chemical imbalance in the brain that makes it extremely difficult to concentrate and stay on task. Fortunately, there are ways to manage all of that, and since my diagnosis over a decade ago I have learned many strategies and coping skills, and implemented the use of organizational tools, that have dramatically changed my life for the better. I am far from perfect as this is a daily challenge for me but I have equipped myself with the necessary tools to run my business and manage my life successfully. 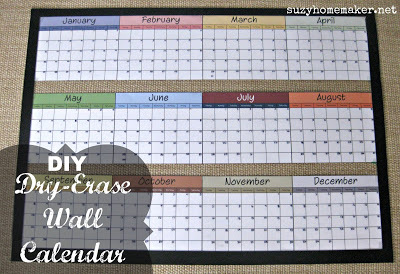 Using a large calendar like the ones listed below is one of the ways I control this ongoing struggle. My favorite is the 48×32 inch size because it’s the largest. The 36×24 sizes work well too, but I wouldn’t recommend going smaller than that. You want something you can see clearly and write on legibly. I also like the laminated kind that you can write on with a dry erase marker. For some items I recommend using a permanent marker (there are ways to remove permanent marker from laminate/white boards). I also like the idea of color coding and using stickers, like Caterina mentions in her blog post. 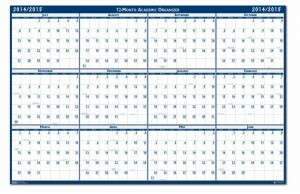 I purchased the At-A-Glance 2014-2015 Academic Year 2-Sided Vertical and Horizontal Erasable Wall Calendar in the 48 x 32 inch size because we are halfway through the year and couldn’t see spending money (it sells for about $25-$30) on a calendar I was only going to use half of. 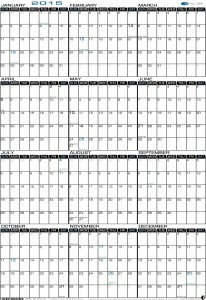 Of course I plan to purchase the 2015 Calender Year version at the end of this year so my logic there may be a little flawed. It’s ok, I forgive myself. I also like that it is reversible so that it displays vertically on one side and horizontally on the other. What would be really cool is if they made the reverse side the following year so that I only had to buy one every 2 years. I’m sure it would cost them about the same to make it and they could charge a little more for it. They make more, we spend less, everybody wins. But what do I know about sales and marketing, right??? Perhaps there is a version like that and I overlooked it. If you know of one, please share the link in the comments and I will check it out. 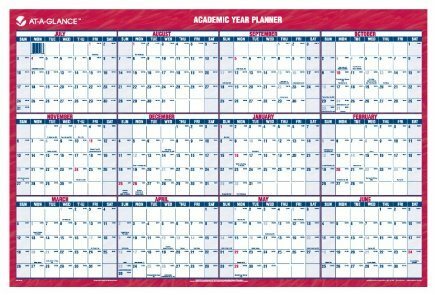 If you like the idea of an academic year calendar (aka Fiscal Year July – June) but would like a smaller size, check out House of Doolittle Write-On/Wipe-Off Academic July 2014 to June 2015 Wall Planner. This one runs about $23 and is also reversible so that you can hang it vertically or horizontally. Their 2015 Calendar goes for about $25. House of Doolittle also makes a scenic calendar. 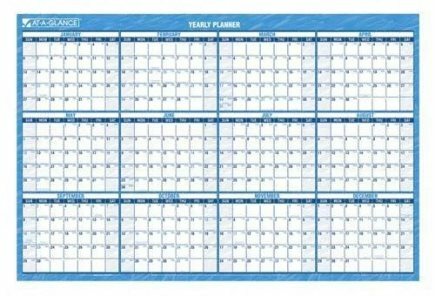 Below is their 2015 Earthscapes Scenic Laminated Write-On/Wipe-Off Wall Planner. It’s large (32 x 48 inches) and has some calming nature photos. Maybe you could incorporate some feng shui practices? It sells for about $32. The images on the horizontal version are different than those on the vertical side. Click here for instructions on how to make ^this^ yourself. If you liked this post and would like to receive an email notification when my next free webinar on Organization and Systems for your Direct Sales Business is scheduled, sign up by clicking HERE. You will also receive my free gifts as a thank you.